This is a fast, easy meal, perfect for a busy weeknight. It should only take you about thirty minutes to make, provided you have leftover rice in your fridge. 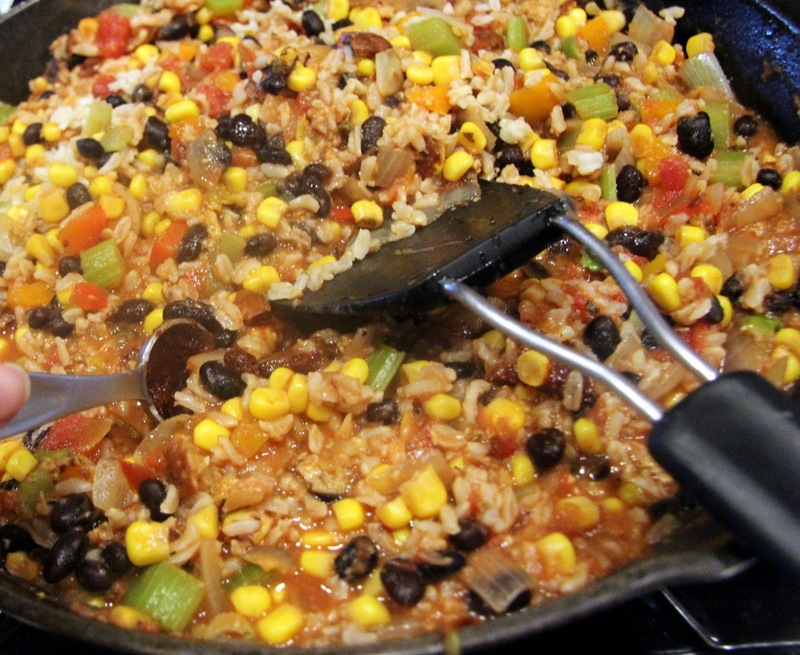 You could make a more authentic Spanish rice by toasting the rice with the onion and adding more liquid and blah, blah, blah, but that’s not what we’re doing here. 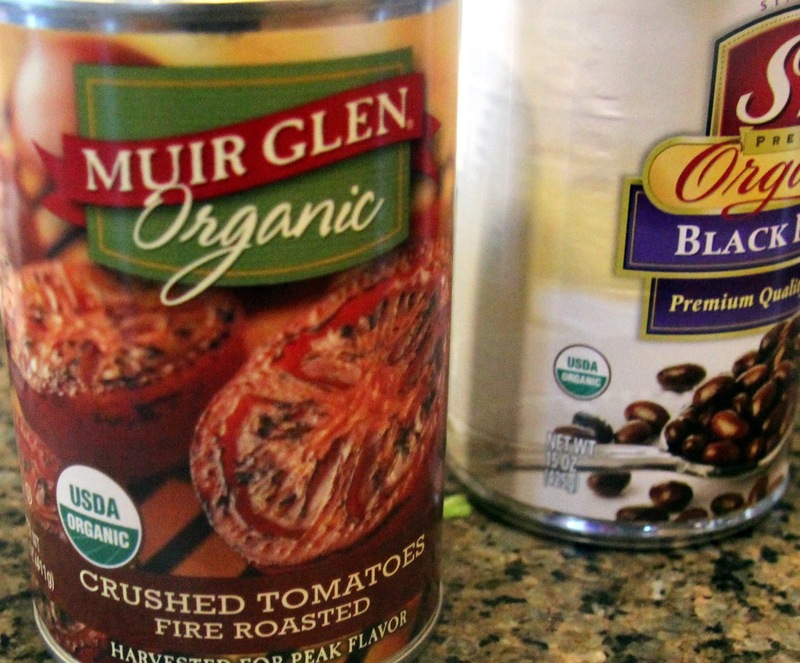 This is a great example of how to make the most of what’s in your fridge, freezer, and pantry. My thought process went sort of like this: I’m sick of Easter ham and I want something spicy. Nicole (my niece) heated up one of those frozen chipotle black bean burgers earlier and it smelled really good, I should do something with those. Oh good, I have leftover brown rice, bell peppers and celery I need to use. I’ll start with an onion. These fire-roasted tomatoes would be good and this corn would sweeten it up. 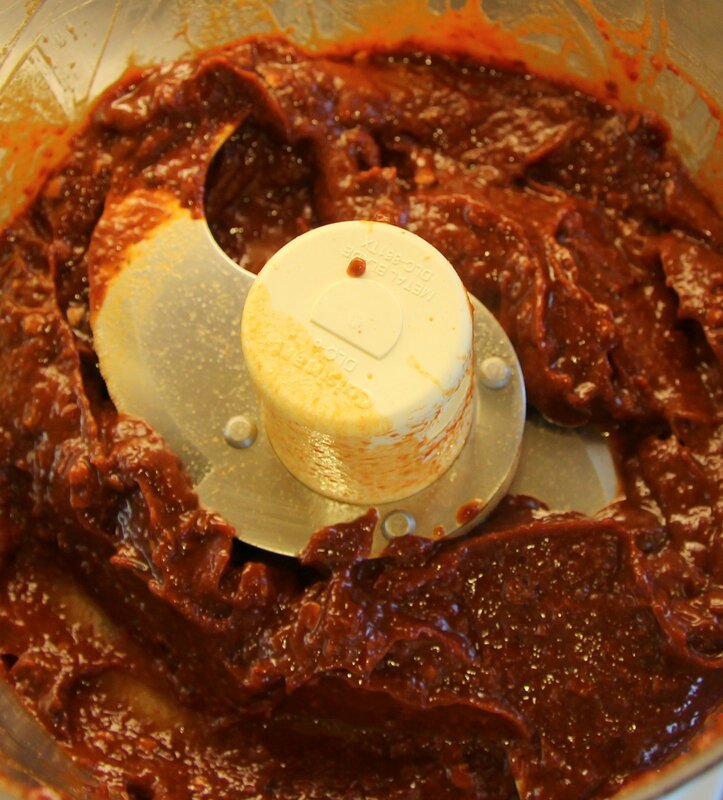 I’ll use pureed chipotle in adobo to add some extra smoky heat (I know you’re making fun of me right now and I don’t care)… And, thirty minutes (okay, maybe 35, I’m no Rachael Ray) later, dinner was ready. And it was delicious! 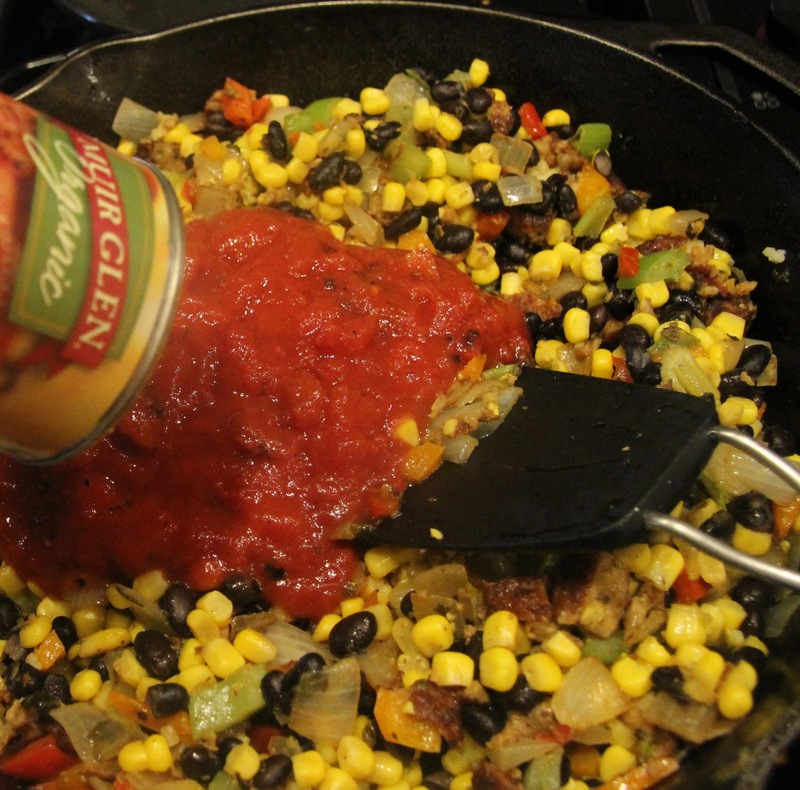 I buy very few frozen “convenience foods” but I do usually have the Morningstar Chipotle Black Bean burgers on hand. They’re pretty darn tasty as my very skeptical niece has learned and they’re not as terrible for you as some things. Yes, they have a lot of ingredients but most of them are recognizable as food and they have lots of protein and fiber to fill you up. 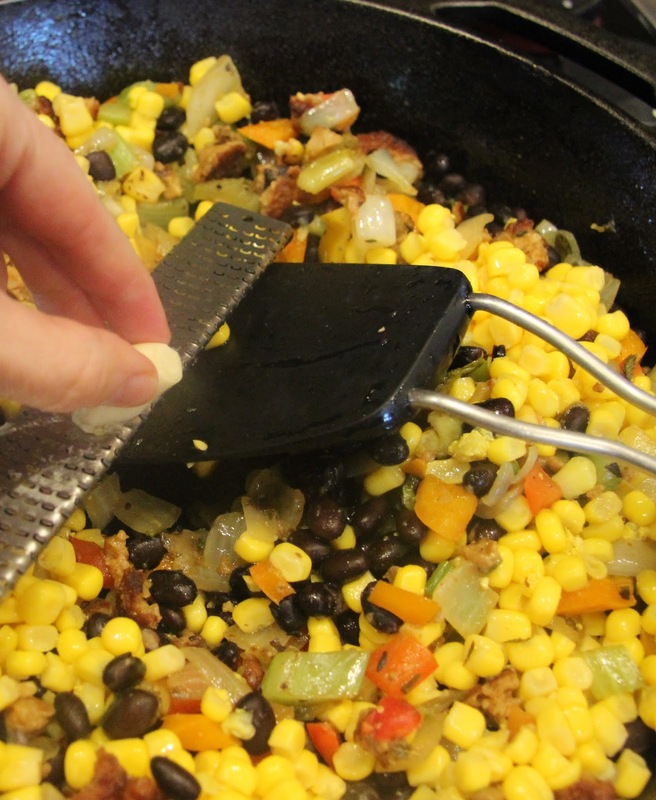 They’re great crumbled up on salads, in tacos, etc. Guess where I get them… Yes, Costco of course, you know me too well! I’m wondering if you have a cast iron skillet yet. If you’re always slightly anemic like I am, it’s great to cook with cast iron because it can really boost your iron intake, especially when you cook with more acidic foods, such as tomatoes. They’re really reasonably priced too, you just have to take care of them and keep them seasoned so they don’t rust. Also, they are excellent for getting a good sear when browning meat and fish. As usual, feel free to mix it up a bit and make substitutions where you need to. 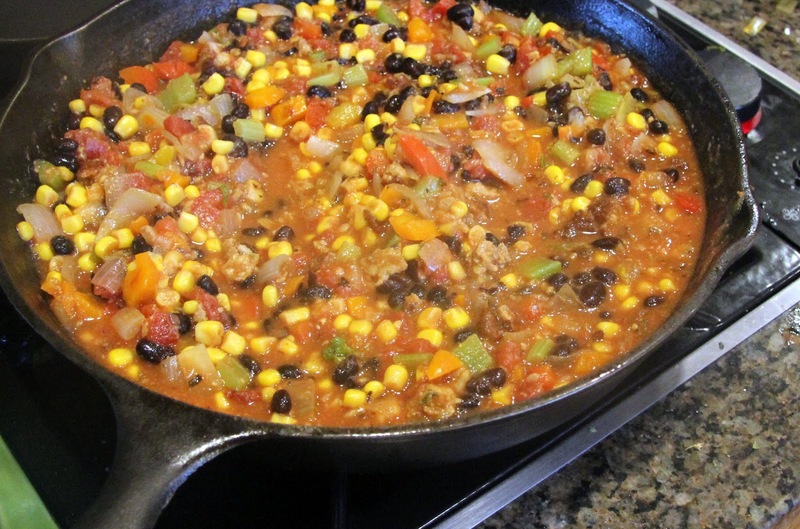 Preheat a large skillet or dutch oven on the stove on medium/high heat. 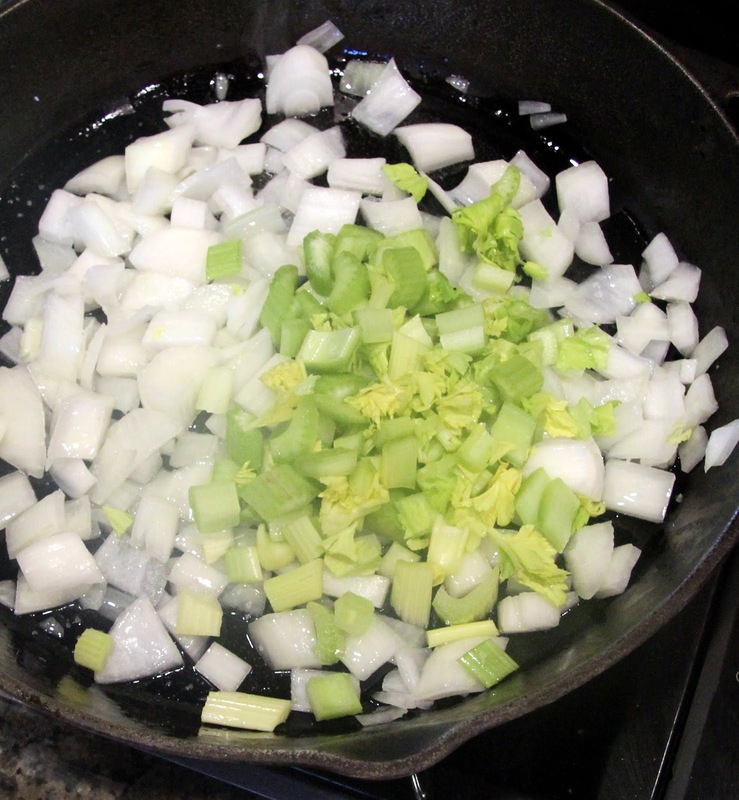 Add oil, onions and celery. Saute until they start to sweat and become soft. 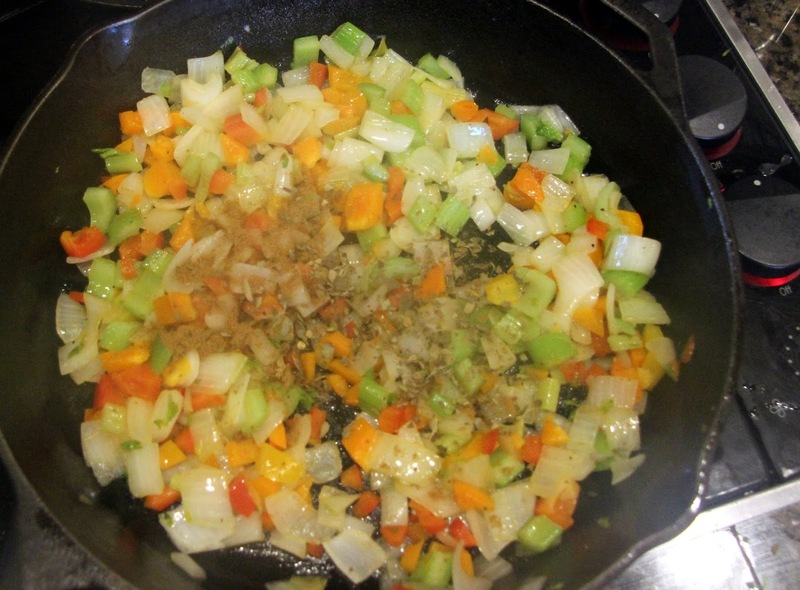 Add bell peppers, salt, pepper, cumin and oregano and saute until bell peppers are soft. 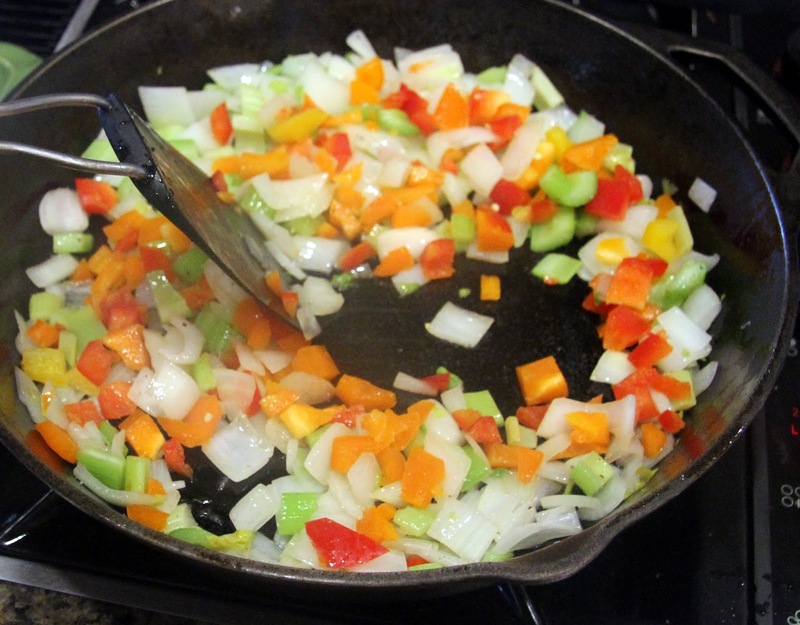 Total saute time from start should be @ 10 – 15 minutes. 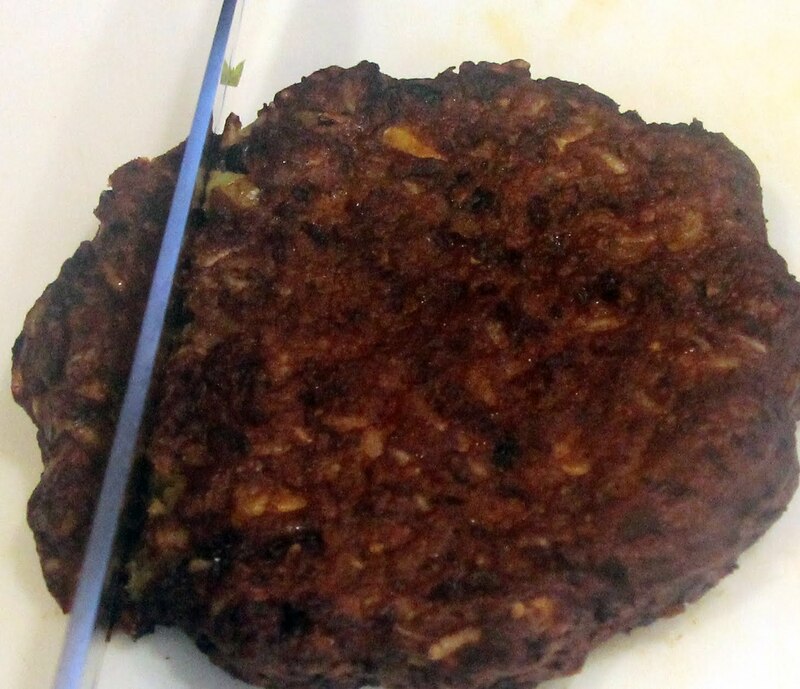 Thaw black bean burger and chop. 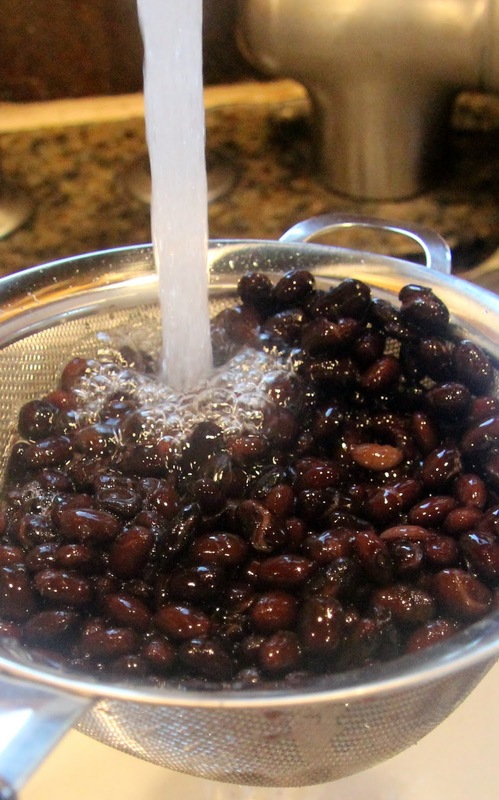 Rinse black beans and drain corn, then add both to skillet and stir. Stir in rice and stock. 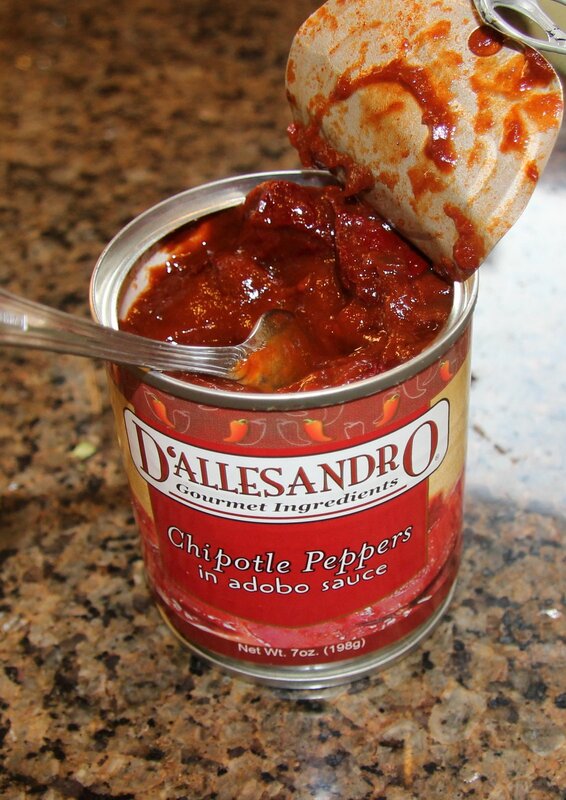 Puree a can of chipotle in adobo if you have it. 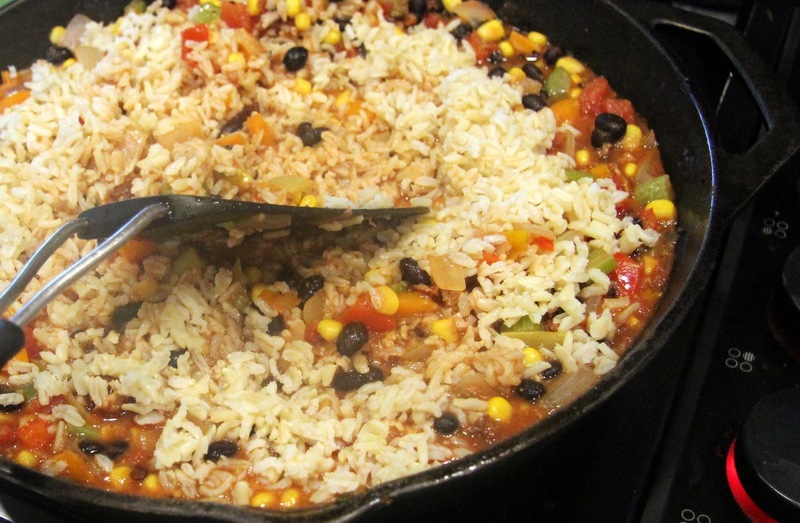 Add pureed chipotle in adobo to skillet. 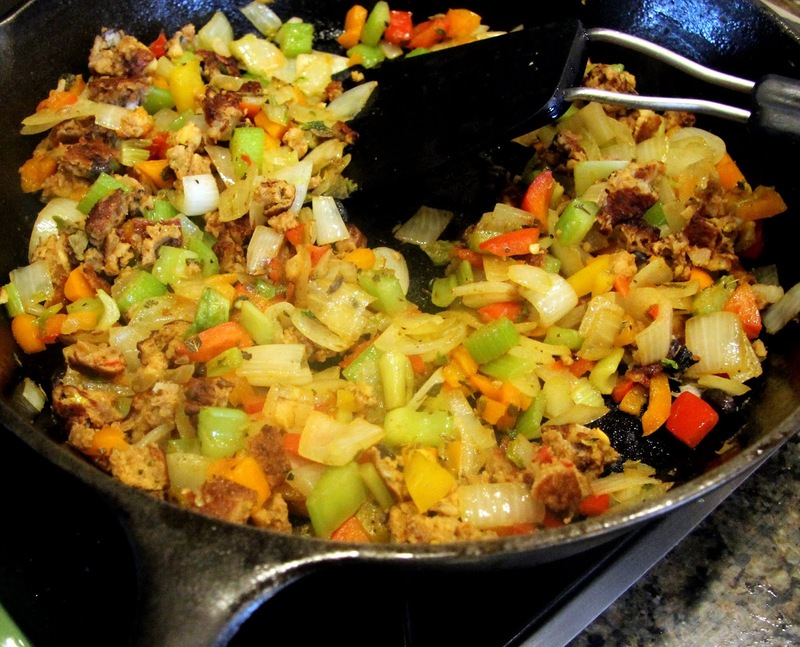 Allow mixture to simmer and come together for about 5 minutes before serving. 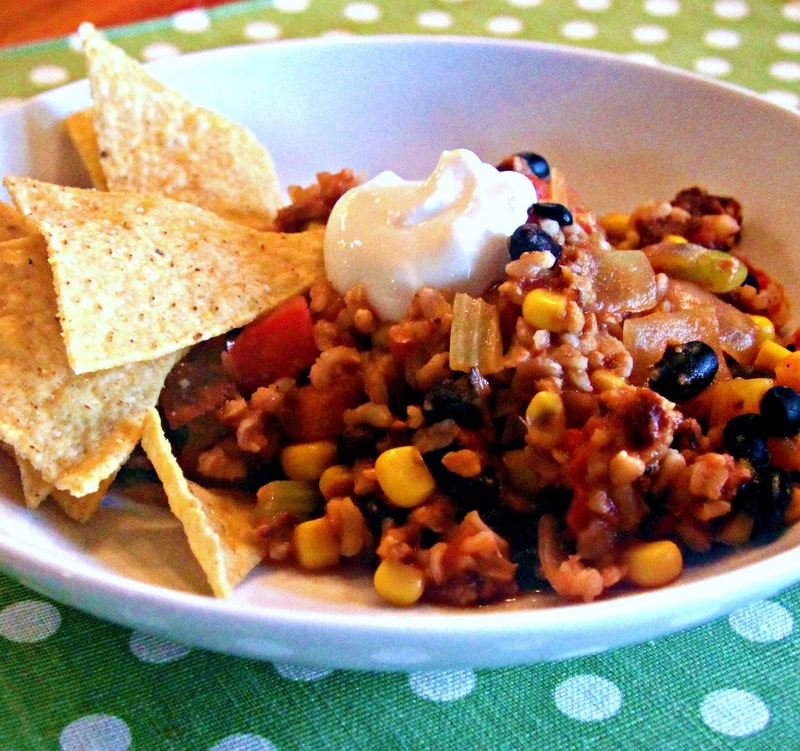 Top with sour cream/Greek yogurt/grated cheese, whatever you like and serve with chips or cornbread.